Hey guys! Ryan here from OnProperty.com.au helping you find positive cash flow property. And today I want to do this audio-only podcast to talk about why being an uneducated property investor is so risky. I had a couple of things happen today that just made me be very worried for the general market in terms of the tactics that people are using in order to sell properties and to make a profit on the properties that they are selling to uneducated investors who are overpaying for properties. The first one that I want to talk about is an email that I received from someone marketing their property. Now I could not work out whether this person was an individual simply selling a property that they owned or if they work for some sort of company that is trying to sell this property. Basically they sent me a link and they say, “Please see the attached link which may be of interest to your client base.” I do have a relationship with a few real estate agents who send me properties that may potentially be positive cash flow that I might want to share with On Property Listings customers who receive a new property listing every day. So I am not not used to getting these. I am used to getting these and then looking into them to see will these suit my list? Is this something that is interesting for them? And so the price for the property was $389,000 and it says lease: 12 months at $1,300 per week and the property was in Bathurst. And I am thinking to myself, $1,300 a week for a property in Bathurst. That just sounds like a mining town price for a property. Who is going to pay $1,300 a week to live in Bathurst unless of course you are on acreage or on a big farm or something like that. And so my red flag went immediately up and so I responded and I said, “I actually did a bit of research. Why is this property selling for so much when 9a – obviously there has been a subdivision here, sold for $410,000 just a few months ago, about 6 months ago. So the property next door sold for what, $279,000 less than this one. And how can it rent for $1,300 a week and I looked into the area and I looked into prices within a couple of streets of where this property was listed and I looked for 5-bedroom houses which is what it was and I could see like most of them are renting for less than $450 per week. Now this is a new build property, it is in better condition but still if someone wants a 5-bedroom house they are going to be looking at all 5-bedroom houses for the areas. And if everything is around $450 per week, I can understand if you have the best finishes, if you have an absolute awesome house, a couple hundred bucks a week extra, probably the top of the market. But $1,300? Like a thousand dollars a week more than a 5-bedroom house that is not brand new, I am like what is going on? What am I missing? And this person was talking about this house is younger than the other one that sold. Yes, fair enough. It looks better, it still is 7 years old and it says it is nearing the end of a 12-month tenancy at $680 per week and they are offering a 1-year premium rent for the first year to provide a bonus to a buyer rather than pay the equivalent in fees to an underperforming agent. And I just want to muse about this to everyone who listens to On Property and who listens to me because I do not make money through selling property. I do not make money through being affiliated with a sale of a property. The closest that I have is I recommend Ben Everingham who is a buyer’s agent and if you go through him and you get his services then I get a commission for that or I get a referral fee for him. But I am not directly linked to the sales of any property and the properties I list to or share to my members or share with my members for On Property Listings. I am in no way affiliated with those properties at all. So I make all of my money through education and through services to help people, trying to do what they are already trying to do which is find and invest in positive cash flow properties. And so things like these really worry me and why it is so important to be an educated investor and to know how to do your research because an uneducated investor may look at this, let us say I share this with On Property Listings. A hundred and fifty plus people saw this, it looks like a really good deal. 700 grand renting for $1,300 per week so you are talking a 9 plus rental yield in Bathurst, in an area that does not have that high rental yields and you are like, “This is a good price. This is a good property.” But if you do not do your research you do not realize this property is actually renting for nearly half that, $680 per week when they are bumping it up to $1,300 – that is $620 per week that they are adding onto it. And that is going to cost them in the first year. Let us say they rent out the property for $680 and they pay you the difference for the rental guarantee; $620 per week, that is $32,240 per year. Now are they paying you this out of the goodness of their hearts? Seriously, ask yourself this question. When someone offers you a rental guarantee, are they doing it because they are just awesome people, they are super lovely and they just want to ensure that you are comfortable and you do not miss out because they are so passionate about you. They care so much about you that through the sale of this property they want to ensure that you do not go out of pocket. Look, the answer 99.999999% of the time is going to be no. People do these rental guarantees, the most times I see this, it is a ploy to sell overpriced properties. They say, “Yeah, purchase this property. It has a rental guarantee of x amount. You know that is a 7% yield.” You do not actually realize that this is a complete rip off, that the property – I am overpaying for it for by $70,000 or whatever and they are just giving me this guarantee as a way to get me to buy this property without actually knowing about it. Now let us go into a comment that someone who actually purchased a property with a rental guarantee has written on my site about a company and they said, “Do not believe anything the property reports provide. They told us the $475,000 investment will earn up to $800 a week, fully furnished or $675 unfurnished.” I do not actually know the head rental guarantee but they said the property is vacant the third time now and they cannot give it away for $300 per week. They got their money back from the company but they have lost a lot more and they are saying it is fully constructed, blah blah blah. The $475,000 property is now valued at $275,000 and then they go into more detail. So basically their property has gone down in value about $200,000, because they obviously could not do their research so they did not do their research into what is this property actually worth. So it is important that when you are looking into property and when someone has presented a property to you that you go ahead and do your research. I think if you find a property searching yourself on realestate.com.au, it is less likely to be overpriced. There is still a chance that it could be overpriced, you need to know your market. But if you have not found it and someone comes to you to present a property, there is always a cost in reaching people. There is a cost in reaching out to people and things like that. I have 10,000 who subscribe to my email newsletter. Now I could potentially sell ads to that email newsletter. I could send out an email that is just a marketing message for another company. I think I could make like 25 cents per email person that it goes out to. So what is 10,000 times by $0.25? $2,500. I could make $2,500 by sending out an email advertisement to the people who trust me and who listen to me. And so to reach people in the property space, to reach you, they are paying money to do that. Or if it is something like, you found me through my blogs or through my podcast or whatever, like this takes time for me to do and time that I am not getting paid for but then I get paid on the back end of this because of percentage of you sign up for my educational programs and things like that. So if you have not gone searching for this yourself and found it on realestate.com.au or domain.com.au it is pretty safe to presume that a significant amount of money has actually gone into reaching you as a potential investor. And that money, that marketing cost needs to be made back in terms of profit in order to keep the engine going and to keep the company going and making a profit. So yeah, just be super careful of people who are saying this, “This rents for something,” or they actually have a rental agreement where it is renting for this much. Definitely go ahead and do extra research to find out what the other properties in the area rent for. But it is such limited thinking. What is a better thing to do is: let us say someone presents me with an opportunity and it is a 2-bedroom unit. Let us say a 2-bedroom house in Bathurst or something and it is $500,000. Let us say 4-bedroom house in Bathurst at $600,000. It is a new-build property, house and land package. Most people go: Should I invest in this house worth $600,000 or is this something that is going to make me say no, I should not invest in this house? Then most people actually look into the company and they say, “Well, what is the go with this company, should I invest with them or not?” And they go online and look. Most of the stuff are only in forums and you do not really get a response as to whether you should or you should not invest in this company and all of the time you have the salesperson in your ear as well who is trying to deal with your objections. And so you are in this yes or no situation where you have a salesperson who is really convincing and saying, “Yes, you should invest in this.” And on the no side you have a bit of fear. You have forums that do not really give you much information and if the company is smart then they are … that sort of stuff so you never see it anyway on Google. So you are in this yes or no situation. Now, think about the actions that you are going to do differently. When you go to the yes or no, the only actions that you do are to really find out what is wrong with this company, are there any issues with this company, and then talking to the salesperson to find out the reasons you should invest. They are the kind of actions that people tend to take however when you change the question and you say, “Well I have $600,000. I have decided I want to invest in Bathurst. What is the best property to invest in?” then all of a sudden you are on realestate.com.au looking up properties. You are calling and talking to real estate agents. You are looking at the rental yield for properties in the area. You are finding out what is a good street, what is a bad street in Bathurst, where should I invest? And then all of a sudden you have, let us say, a 4-bedroom house for $600,000. You can say, “Well, I could buy that house that is going to be brand new.” Yes it is going to have tax deductions but actually down the road, just a couple of streets away, there is a 4-bedroom house that is worth $400,000. That is $200,000 less and there is a 1-bedroom unit in the center of Bathurst for $200,000. So I could potentially buy 2 properties for $600,000. I would get more rental yield. And you could also say that that 4-bedroom property for $400,000 is only renting for $400 a week. How are these people offering over a thousand dollars a week. Maybe there is something wrong with that. So rather than just putting yourself in a yes or no position, ask a question that says what is the best thing I could do with my money or what is the best thing I could buy in this area. And you all of a sudden start looking at things really really differently. Another thing that happened was someone contacted me on YouTube, sent me a direct message on YouTube. I do not even know how you do that but good on you for working that out and I received it. It was a guy called Frank and he was talking about a company called Canterbury Property Services and they are talking about interest capitalization strategy as a way to invest in property and reduce your non-tax deductible debt aka your ‘home loan’. When I did a video on this and I was like what is interest capitalization strategy? How would you actually use that? It is actually like, maybe some tax benefits but there is not a whole lot of breakthrough investment strategy that comes with this capitalization strategy. It is not a breakthrough strategy. It is probably – like the way that I thought about it was it increases your debt over time. Yes you pay off your home loan but in terms of your property, the debt goes up on that. So yeah, you paid off your home loan but then you can only capitalize interest for 12 months to 2 years and then you end up in a high and negatively geared situation making it harder to become positive cash flow. So it seemed like Canterbury Property Services was kind of using this as a way – I do not want to say to confuse people but I know a lot about the property market and I was pretty confused about why this was a good idea and why I would want to do this compared to standard investing in property. And so I think there are companies out there that want to confuse you and they want to say here is a strategy to do but in the back of their minds they have a goal to sell you a new build investment property that they can make a commission on and they are selling you a strategy to get your service. And it happens across the board like I do it. I talk about positive cash flow properties. I talk about how much I like positive cash flow properties. I talk about the pros and cons of positive cash flow properties. I talk about how to find them and all of these sorts of stuff. And a lot of my products and services are based around positive cash flow properties so I have a course on how to find them. I have On Property Listings where I actually show you positive cash flow properties. I have suburb research and I am about to bring out like a property evaluation that is less around positive cash flow properties. I market Ben’s services and he helps people find high yield properties – not always positive cash flow but often positive cash flow. But yes, a lot of the money that I make is from people who want to invest in positive cash flow property. So obviously it is in my best interest to talk about positive cash flow property and to spin to you that it is a good idea and definitely there are some bias in there from the fact that I make money from teaching people about positive cash flow property. So there is always going to be buyers in what I say because of the way that I make money. The same if you have a strategy session with Ben Everingham. He does free strategy sessions with potential clients which can range from 15 to 60 minutes. In his strategy session, you go through and you talk about what is the best way to invest in property, blah blah blah. But obviously there is going to be a bias with him because he wants you to purchase his services and he is acting yes, he is trying to help you and the good thing about him and the reason I work with him is he is very transparent. He is not super sales-y but there is always going to be a bit of bias to market to you. And when it comes to me and Ben care so much like me and him have conversations about how much we care about this industry and how we do not want to rip people off and how we do things to make sure that people know what they are doing even if it is at a cost to us and it means we cannot sell our services. We have phone conversations that last an hour like talking about this sort of stuff. But you have companies out there that are just looking to make 40 grand or 70 grand in commission for every new build property that they sell and that is their business model. They know these properties are overpriced. At least the higher ups do because they are getting all these complaints from past customers but they do not care for some reason. They do not care that you are buying an overpriced property. They just care that they are making their commission, that their sales engine is working and that their properties are selling and they are continuing to grow their company and to grow their individual wealth. It is in their best interest to create something that is so biased that the only way for you to achieve it is through them. And I look at this interest capitalization strategy and it just does not make sense to me and the only way that I could achieve it is to go through someone else like to go through another company that knows how to do it because I feel like even with a lot of study, you need to be super financially awesome in order to actually make this work. I have a mate. His name is Tim. He is a treasurer and he is just an Excel spreadsheet nerd and he is a genius with numbers and I feel like him with his Excel spreadsheets and his knowledge of money could work and do interest capitalization strategy and make it work and make money. But me, who does not think in terms of spreadsheets and like if you followed me for any amount of time, you know I am all over the shop like I could just not make it work. I just like the basics. I like the positive cash flow. It just makes sense, you make money through passive income. If the property goes up in value, great and there are opportunities to add value through renovation and things like that if you buy the right property. And so he could make it work but I could not and I am still pretty smart at property. Imagine people who are not as educated as me investing with these people not realizing that these people are actually making money through the commission and the sale of the product. Another thing there was a customer or reader who emailed me saying that they are FIFA worker so fly-in, fly-out. In their minds generally, those guys make good money and he was looking at purchasing a new build property in Darwin. I do not know if he has been approached by someone or what the goal is but I actually did a video on it and I was like, Darwin has, over the last 18 months, the vacancy rate has jumped from 2% to 3% to upwards of 10% in the area which is an extremely high vacancy rate, which means the area is probably over populated and then you have the risks that we have talked about in terms of property marketers charging large commissions on new build properties so the properties are potentially overpriced. There are just so many people out there who want your money. When you are investing in property, you are dealing in such big money. You are talking hundreds of thousands of dollars which we do not see in day-to-day life like when I go and buy a coffee, I spend $4. I understand $4. When I go and buy a computer, that is a couple of thousand dollars. When I go and I go to the supermarket I might spend a couple of hundred dollars like we are used to dealing in tens or hundreds or maybe thousands of dollars but rarely do we ever deal in hundreds of thousands of dollars. And to me, the difference between a coffee that $3 and $4 is a dollar, no big deal. But the difference in a property between $300,000 and $400,000, I feel like sometimes we treat it the same. That is just a dollar or it is just a hundred grand like we do not really think about how big a hundred grand is and how many coffees that a hundred grand could buy you. But the reason that I wanted to create this podcast episode and go on this sort of rant is basically just to say become an educated investor. Spend the time to understand how to research an area and how to research a property and whether you do it through the educational courses I have, through the free content that I have, or you learn how to do it through someone else; like I think Helen – I cannot remember her last name, but she does Helen’s Rant like you can check out her podcast. She has a paid course and she teaches people how to do research into an area and she is very diligent about that. She is really good at it. Jane Slack-Smith who teaches the ultimate guide to renovation, she is really good at doing a research into an area so you can check her out. Dymphna Boholt, I do not know how much she goes into research of an area but definitely Helen and Jane I know do a lot about researching an area. So you could learn through me, you could learn through them. I do not care how you learn but learn how to research an area. Learn how to understand is this area likely to grow. Even something as simple as looking for vacancy rates in Darwin automatically showed me a 10% vacancy rate. That is extremely high. I talked to Ben Everingham, the buyer’s agent that we have been talking about, he was like anything that is over 2%, that is high. And so to see over 10%, that is just extremely high. And so even learning to do something as easy as that – and you can search the vacancy rates in any area, just go to OnProperty.com.au/vacancy and that will redirect you to a tool by SQM Research. An absolutely awesome tool for free. You can check them out. There are so many free resources: there is the Census QuickStats; there is walkscore.com which can show you what is in an area; there is a site called onthehouse.com.au; there is oldlistings.com.au. There are all these free services that allow you to research an area. Another one is Your Investment Property Mag has a top suburb section that is really good. There are all these different research tools that you can do and it can take you like 10 minutes to research an area and to just understand is this area good? Is this area bad? What do I need to look out for in this area? It is really easy to do. If you guys want I do have a course on this. It is a paid course. Go to OnProperty.com.au/suburb and you can check out the details of that course if that is something that you are interested in. I am launching in about a month or so a course on how to evaluate individual properties and so you can check that out. Go to OnProperty.com.au/property to check out that course. So that is 2 courses that I have coming out shortly that will help you do the research. But I also did a free episode on the biggest mistakes people make when doing suburb research. That is definitely good to look at. Let me just find out where exactly that is located. I am just going to my blog to find out what is the exact page is. Go to OnProperty.com.au/310 and that is the 7 mistakes people make when doing suburb research. And that is definitely a good post so check it out, that is free. But just learn how to do research. And the simplest way to do it is just look at comparable sales for the area. And so that is like the easiest way to do research and make sure you do not get stung as an uneducated investor is to just look at other properties in the area, see what they are selling for because generally it is the market that determines what a property is worth. And these property marketers and property advisors are good at giving you reports and not showing you all the data saying this area is going to grow and here is this property for x amount of dollars. But they do not say this area is going to grow and here is this 2-bedroom unit for $430,000 but also you can buy an existing 2-bedroom unit in the area that is pretty similar for $350,000. They are not going to say that to you so you need to go out and find it for yourself. So it is very risky if you are an uneducated investor in the space because you just do not know if what people are telling you are true or if it is not true. You do not know if I am just feeding you lies right now. I am trying not to like I am trying to do my best to educate people to go out and to do research themselves and to find out themselves. But if you are uneducated, you just do not know who is telling the truth and who is just trying to get your money. And when you are dealing with $500,000 or $600,000, to you or to a lot of people we do not understand the difference between $400,000 and $500,000. They are all arbitrary numbers to us. But someone knows if I can make a 50 grand commission on a $500,000 property and you are not really going to realize because it is such a big money. That is why there are so many people in the property space who are just trying to make money from people because we are dealing in such high numbers. The commissions are so high the potential for profit is so high like I could make so much more money from OnProperty.com.au if I simply sold you guys new build properties that have the potential to generate a positive cash flow. Like I could make more money selling 2 properties a year than I do from all the educational resources and stuff that I sell through my site. So the potential is out there to make big money but I am trying to help you guys so being an uneducated property investor, it is so risky. And as you can see from some of these examples, someone who is inflating the rent on their property for God knows why, I have no reason why they are selling this. If it is illegitimately good property, why not discount their property by the $30,000 extra you would be spending in rental guarantees and just sell it for $30,000 less. Why? Why are you doing this? What is wrong with this property to make you need to do this? To sell this property and to mislead people and make them presume that the property is going to rent for $1,300. It just seems very unethical to me. So you have those people. You have people with the interest capitalization strategy that makes no sense to me. That might make sense to super Excel expert Tim but probably as a normal investor is not going to make sense to you. Why? Why do you need to spin it? Why do you need to put makeup on some poo like basically, why do these things? Why not just learn to do your own research and pick a strategy that you feel that you can excel at. Get good at that strategy whether it be renovations or positive cash flow or negative gearing or capital growth or subdivision. Become an expert in one particular thing to do with property and just do that and repeat it. And that seems to be how most people make good money through property. Find a strategy that works and they just repeat it. They are not doing all these fancy crap that just makes no sense to anyone and you are making money from thin air without doing anything and in 3 years you are going to drive away in a Ferrari with no debts with a million dollars a year in passive income. Stuff just does not happen like let us be realistic. Let us put in the work to become smart investors, to become educated investors, to minimize our risks, and to make sure that the properties we are purchasing are good and we are not just getting stung. I think I need to talk less about the risks. I need to talk less about just mitigating risks and I need to empower people to become excellent at property research. I need to empower people to become champions of their own lives, to make their own decisions. And I think my focus has definitely been in the last month or two in just warning people to do their own research and stuff like that but I think there is probably more power if I stop trying to warn people and I just start trying to encourage people to be awesome and encourage people to take control of their own lives and then teach them here are some ways that you can do that; here are some ways you can research property. 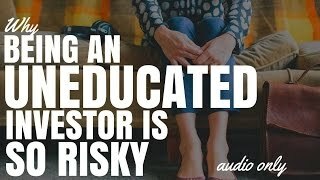 But rather than just being it to be careful like even this, why being an uneducated property investor is so risky, why can I not talk about something positive? So hopefully you guys will be seeing more positive things from me in the future. I want to champion you in your life. Hope you achieve great success. I am going to finish off my discussion there. I just wish you guys the absolute best in your property journey. And until next time, think positive.